To stay warm when temperatures drop outside most people, that can afford to do so, will heat their homes or workplace even if no one is in them. If freezing pipes are not the primary concern for heating an entire room or building, the world may now have an improved method for keeping people warm while being inside or out. Scientists have developed a novel nanowire coating for clothes that can both generate heat and trap the heat from our bodies better than regular clothes. They report on their technology, which could help us reduce our reliance on conventional energy sources, in the ACS journal Nano Letters. If this new textile improvement works well, it can aid in global energy consumption reduction. Reducing indoor heating would help reduce the world’s total greenhouse gas emissions. Rather than work to keep the warmth inside a building via insulation or other methods, the team behind this new development wanted to focus on people rather than spaces. The concept being to keep the people warmer without the added cost and energy consumption required to heat an entire room or building. The researchers developed lightweight, breathable mesh materials that are flexible enough to coat normal clothes. When compared to regular clothing material, the special nanowire cloth trapped body heat far more effectively. Because the coatings are made out of conductive materials, they can also be actively warmed with an electricity source to further crank up the heat. The researchers calculated that their thermal textiles could save about 1,000 kilowatt hours per person every year, that’s about how much electricity an average U.S. home consumes in one month. 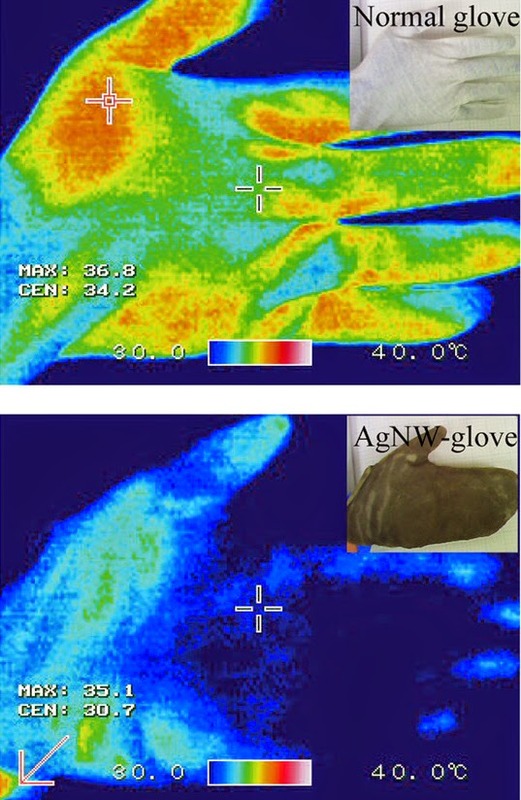 Heat-based images show a conventional cloth glove (top) lets warmth escape while a nanowire glove traps it. The personal thermal management using metallic nanowire-embedded cloth sounds like a great step forward for the textile and apparel industry. Another great example of progress. According to the research report, the metallic nanowires form a conductive network that not only is highly thermal insulating because it reflects human body infrared radiation but also allows Joule heating to complement the passive insulation. The breathability and durability of the original cloth is not sacrificed because of the nanowires’ porous structure. This nanowire cloth can efficiently warm human bodies which certainly sounds like a wonderful thing in cold weather environments. Apparel Search appreciates any and all attempts to help improve the environment. Hopefully this personal thermal management cloth will help reduce greenhouse gases as the research implies will be the case. We are looking forward to seeing products utilizing the nanowire cloth reach the apparel market. Learn more about fabric and the textile industry here on Apparel Search.